It exists a plethora of dashboard solutions, on-premise, SAAS, free , affordable and expensive ones. To help me into the research of an open-source solution to integrate my own personal project, I did a small study of the available open-source dashboard solutions and defined some criterion. 0.1 How to choose my dashboard solution ? 0.2 Data storage or data sources ? How to choose my dashboard solution ? open-source : since my project is also open-source, I want to provide both open-source and vendor integration. To begin with, I want to elaborate first the open-source integration. Data storage : some dashboard solutions are providing their own embedded storage. Your time series are keep and you can control your history. At the opposite storage-less dashboards are using the concept of datasource. A datasource is a script or a component that will contact a remote resource to obtain the required information to be displayed into your dashboard. Therefore you are responsible to provide the exact information for the widget. Is it a chart or a table ? You will have to produce several resources to be consumed. Container : in 2017 no one want to painstakingly install a solution before using it. Therefore I will pay attention to the availability of a Docker image/compose to setup a demo installation on my workstation. Dashboard composition : Dashboard composition is how to create your dashboard, placing your widgets and defining colours and labels… I will identify whether the dashboard solution is offering a GUI/WYSIWYG to compose your dashboard using widgets or configuration files or worse to have to modify HTML/CSS. Data manipulation, aggregation, correlation : Some dashboard solutions have what I would call a “data post-treatment” that allow you to aggregate your values before displaying them? Useful if you want to display the same data aggregated per month, week, day without having to recode your resource. Technology : if I want to perform some customization to the open-source project, is it a well-known technology ? Usage : some dashboard solutions are optimized for certain usages or may be too overkill to implement my DevOps dashboards. Data storage or data sources ? The schema is representing how to use a dashboard with a embedded data storage. 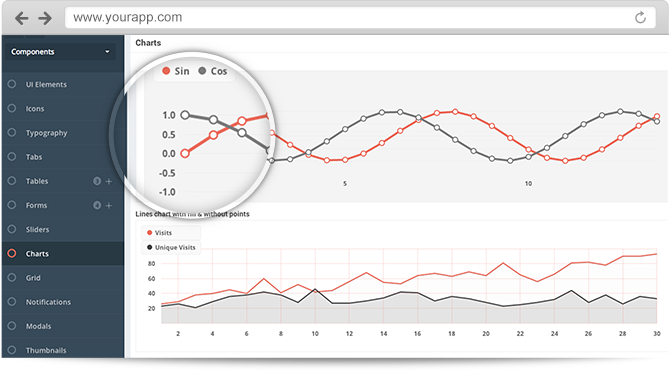 In this kind of solution, the dashboard solution is usually offering an API to store your time series and other metrics internally. The solution includes its own way to store your data and to retrieve them. I recommend this kind of solution if you want to keep track of your own history. Indeed, your data sources may not preserve your information long enough depending of your needs. If the dashboard solution is not offering an API you will have to rely on a batch program or an ETL to convert your data into the expected model. Dashboard using the datasource approach usually does not store the displayed data. Each widget is requiring a precise data model. Each time, your dashboard will be displayed, a call will be performed by each widget to obtain the data. Some solutions are providing a cache to avoid too frequent calls to your systems. This kind of solution is usually simple to use and is providing ready-to-use widgets and integrations. You will have to pay attention about the diversity and the quality of the data sources and other integrations provided by this kind of solution. 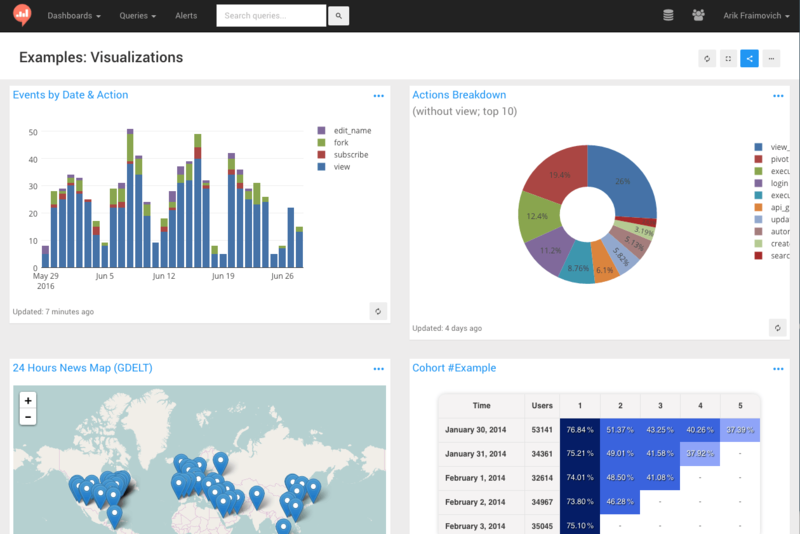 Here’s a look at a few open source dashboard tools that you might consider. 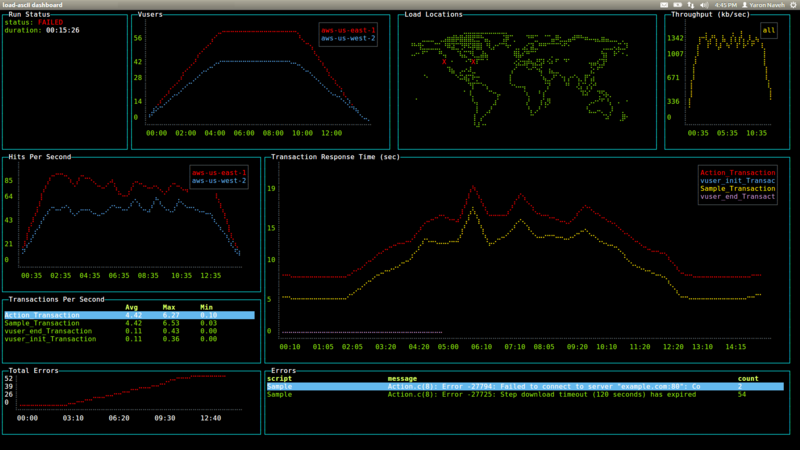 Freeboard owns a nice design, a nice GUI to compose your dashboards. However its features are quite limited and you will have to code your data sources, the list is quite limited. Some widgets are also missing as bar charts. The official project does not offer a docker image though you can find one on the Docker hub. I recommend this great dashboard if you have a rest service ready to be consumed by Freeboard. Mosaïk is a great new dashboard, specialized in the integration with a software factory. More precisely, if you are a developer, you will be very interested to deploy this solution inside your team to provide basic metrics of your factory. This solution is using the concept of data sources even though a widget is also a datasource. It means that to add a new widget you will have to produce both the design and the code to obtain the data. It also the developer to customize completely the render and how to obtain the data. However I have noticed some inconsistencies in the UI design. Mosaïk dashboard has a great UI layout and design and its technologies allow anyone to build a dashboard quickly. The only limits are your ability to produce nice UI widgets and the availability of data sources and rest services to provides the indicators. It contains a real big set of features compared to the two previous solutions. KPI, generic widgets, workspace, security, user management, it’s really a dashboard solution to help an organization to produce many different dashboards with a unique software. TO my opinion, it’s a great dashboard solution but lacking of integration possibilities to REST/SOAP systems. Grafana is a great solution to produce dashboard. They offer a large set of dashboard templates ready to use. They integrate to several databases allowing business to use their own systems efficiently. This project is no longer maintained although the dashboard is beautiful. Keen IO is an alternative to your in-house analytics database. You send them events from your mobile app, website, billing system, or backend servers, all the data that’s too big to store in your application database. More information in this really interesting interview on Stackshare. I don’t know if there are many use-cases but the idea is funny and the stack easy-to-use. This project is both a data query language, a Dashboard UI. It has been designed to simplify the data extraction from various databases by non-technical users. 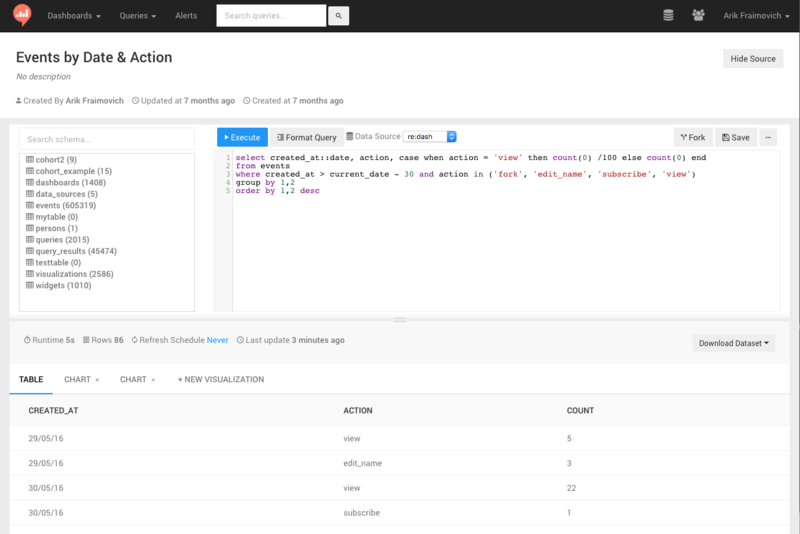 Metabase is an open source business intelligence tool. It lets you ask questions about your data and displays answers in formats that make sense, whether that’s a bar graph or a detailed table. Since this solution is specialized, I won’t recommend it to create your own dashboard unless you need a ready-to-use product. Re:dash is both an Saas solution and available as an opensource self hosted solution. Depending of your needs, you can choose the right solution for you. ReDash provides a useful collections of data sources : PostgreSQL / Redshift / Greenplum, MySQL, Google BigQuery, Graphite, MongoDB, ElasticSearch, InfluxDB, Presto and many others. Re:dash is querying in their natural languages, the data sources, storing the information into a cache (Redis) before displaying your dashboards. The solution also provides some useful features as social sharing for your dashboards and pictures. The solution looks really powerful and promising. Helical Insight is world’s first Open Source Business Intelligence framework which can help you derive insights out of your one or multiple datasources. Helical Insight is having all the features which you generally expect out of any BI tool (be it open source or proprietary). Being a framework, Helical Insight is highly extensible via APIs and SDK, thus features can be extended whenever required without compromising on your business requirement. Pentaho is a famous solution covering many functionalities (Business Intelligence, OLAP, Dashboarding, BigData). The editor is also providing a dashboard solution.